Product #17570 | SKU TT-0508 | 0.0 (no ratings yet) Thanks for your rating! The Tilta XLR Audio Converter for Blackmagic Cinema & 4K Production Camera adapts XLR inputs to 1/4" TRS (Phone) connectors, allowing you to connect industry standard XLR microphones and cables to your Blackmagic Cinema/4K Production Camera. It is a 2-channel passive adapter and attaches to a single 19mm rod or to a 15mm rod when using the included 15mm to 19mm adapter sleeve. It is made from machined aluminium and features about an inch of side-to-side adjustment. 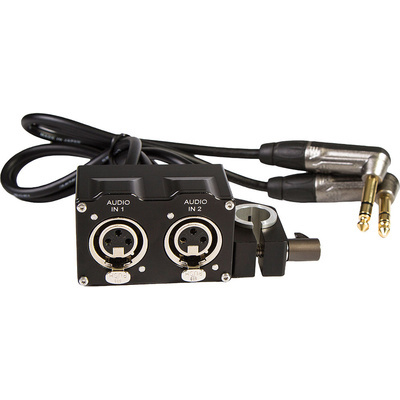 Adapts 2-channels of XLR audio to 1/4" TRS for an available Blackmagic Cinema/4K Production Camera. The single rod clamp design and 22 mm of side-to-side adjustment allows flexibility in positioning the clamp. The included 15 to 19mm sleeve allows you to clamp it to 15mm or 19mm rods.